We first filmed with Moriah when she was 20 years old. She told us about falling in love with music as a young girl and discovering almost immediately how powerful music could be an expression of her faith in God. As a teenager, Moriah spent months auditioning for American Idol, and made it in front of the judges, who told her she was too wholesome for the music industry. A random stranger heard her audition and introduced her to a record producer. She signed a record deal, released two solo albums, and provided the singing voice for Vanna Banana on Veggie Tales (we know, that one blew our minds too). 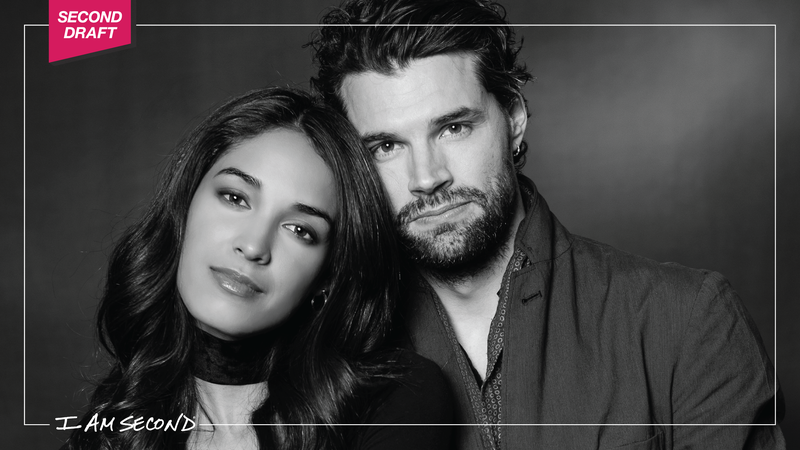 In the meantime, Moriah met and married Australian singer-songwriter Joel Smallbone, went on tour for her second solo record, and formed TRALA – a fierce soulful trio – with two of her bandmates. To sum up, Moriah is out here getting things done, and she’s doing it with grace, faith and boldness. This week, we couldn't be more excited to be reunited with Moriah and her husband Joel for some real talk about love, trust, and marriage. 1. There is power in getting honest about our fears. The thing is, we all have fears. A lot of the time, our first instinct is to deal with those fears by trying to pretend they’re not there, by never looking them in the eye. We think if we pretend we can’t see them, maybe no one else will either, but the more we deny our fears the more power we give them to keep us isolated, to keep us from moving forward. 2. Acknowledging our vulnerability is an act of trust. One of the most common fears in relationships is intimacy. We both fear it and crave it – we want to be truly known and loved for who we are, but we’re afraid that if we're fully known, we won't be loved. Or maybe we worry that we’ll only be loved in our strength, not in our weakness. Moriah and Joel aren’t afraid to acknowledge that allowing someone access to the best, the worst, and the most carefully guarded parts of ourselves is difficult. It takes trust to allow someone to stand in that exposed place with us, but it’s also in that place of trust that deep love and connection and commitment can grow. 3. Sometimes love flows easily; sometimes it’s an act of will. In the Bible, Jesus used the word love as a verb. The love that he models for us is active. He loves with purpose and without condition. He loves with forgiveness. He loves at our most unlovable. 4. We’ll never be enough for each other on our own. In a lifetime together, there are inevitably moments when we are the worst version of ourselves. We get angry. We speak hurtful words. We let each other down. If the strength of our relationship is based on our ability to always be our best selves, we’ll never measure up. The shift in perspective that Moriah and Joel have embraced – to anchor their relationship in God and his love – strengthens their marriage with peace, hope, and freedom. 5. Go to the source. We each have our own complex mash up of personality, past hurts, and projected hopes that we bring to the table in a relationship, and trying to carry all those things for someone else as well as ourselves can feel like a lot of weight. But, God has vast and unlimited resources of love and forgiveness and grace that never run out. When we root our relationships in that love, he empowers us, encourages us and helps us. We don't have to carry the weight alone. For more of Moriah and Joel’s story you can watch their full Second Edition film here. You can also check out Moriah's original White Chair Film here.